Change of events! As you know, when I signed up with Ironteam, Ironman Canada was the goal! There was a hiccup with the slots to IM Canada and IM USA, so there I was in Santorini, Greece registering for an entry to IM Louisville just to ensure that I would have an Ironman event to do in case things don't pan out for IM Canada. We found out this week that TNT was not able to secure our IM Canda and IM USA slots so IM Louisville it is!! Hello Kentucky! I am a bit worried about it possibly being a non-wetsuit swim and the humidity but I think it'll be okay. It has to be! Different location but same distance...same cause..same motivation! Monday- I met up with Renee at the Dailey Method studio to take one of their classes. It's an hour of targeting, toning, strengthening and stretching the thights, buttocks and abs areas! Renee and I are both pretty bad at doing core workouts on our own so a class was the perfect solution! Boy, was it an experience first thing Monday morning!! My muscles got worked to the point of shaking and held planks at the point of pure pain but biting my lip to finish the set! I nearly fell over with laughter when the instructor suggested we try to go into the splits..I mean really..I haven't stretched out into the splits since I was 18! Tuesday- Ran 76 minutes in the morning. Beautiful skies...pink Alcatraz as the sun is rising..nice cloud formation views of Russian Hill as I am running up and over Fort Mason..I really should bring a camera with me on my morning runs. Wednesday- Started my morning with more Dailey Method and then had a track workout later that night. We had to bring our 30 pound trainers to track along with our bikes for a spin/run interval set. Bringing that trainer anywhere is a task! Poor Coach Pete was the recipient of our complaining throughout the track workout. As he arrived, I said to him that I never wanted to bring that 30 pound monster to track ever again! He laughed. I actually wasn't kidding! And then as we're spinning, we brought up the training matrix that the coaches want us to fill out as well, another monster in itself. We told him that it had to be modified! He laughed which meant he saw that one coming!! The complaining was all in fun- and a fun workout it was! Hez and I pushed it pretty hard on the run and had a nice spin workout as well! Thursday- Swim workout in the morning using a tempo trainer. Friday- Dailey Method in the AM and that was it today! TGIF! Saturday- The team had a workout in Orinda. Hez and I didn't opted to stay local and do our 120 minute ride here in SF instead. We met up at Sports Basement Crissy Field at 8am and headed over the Golden Gate Bridge. Halfway through the Bridge, I suggested to Hez that we do the Marin Headlands..she said no hard climbing..which meant no. We made our way down to the end of the Sausalito bike path and decided that would be our turn around. On the way back, we took advantage of the beautiful weather and took a short "sit and talk" break along Sausalito's Bridgeway. Halfway up the Sausalito grade, I suggested again that we do the Marin Headlands to fill in some time and this time Hez gave in and agreed! Woohoo! We made it up the Headlands (surprisingly short and not that hard) and back to SB. 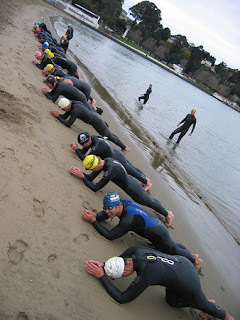 Sunday- The time has come that we started open water training. Air temperature today was 50 degrees. Aquatic Park water temperature was 54 degrees. Like Coach Alex said..mental toughness being built here! 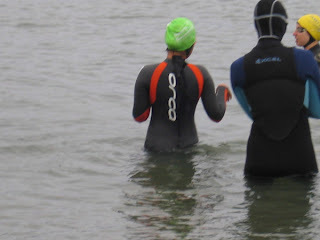 I was excited about today's open water swim because it was my first chance to try out my new wetsuit! My old one from Summer 06 was too big for me now..hence the chaffing I was getting. I got a really good deal on the Orca 3.8 that I couldn't pass up..besides..love the orange! Water wasn't too cold..it was cold but it wasn't unbearable. I've been in worse believe it or not! After a brisk 30 minute swim..we did a 50 minute run with 1 minute pick ups every 4 minutes on the way back. Nice workout with the team! As we were walking up the cars, I saw Mr. Seal out in the water! He was sprawled out..floating around..being amusingly playful! I was a little worried about Mr. Seal with the oil spill so it was kind of nice to see him! 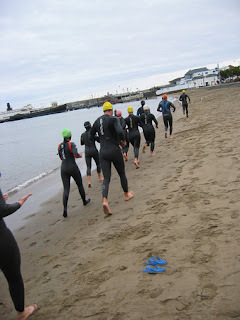 Running in between swim sets! Core in between swim sets..no more planks! !